The Denver Broncos defeated the Washington Redskins on Friday night, 29-17, continuing the third full week of preseason action in the NFL. Second-year left tackle Garett Bolles had a handful of ugly plays where he was beaten quickly in pass protection. It was by no means a terrible performance, but in a division with edge rushers the likes of Khalil Mack, Joey Bosa, and Melvin Ingram, Bolles will need to play at a higher level in order to keep Case Keenum upright. Running back De’Angelo Henderson Sr. led the Broncos with 35 rushing yards on seven carries. Henderson was particularly impressive on Denver’s final drive of the game, as he picked up first downs on back to back 11-yard zone runs, demonstrating both patience and an excellent burst on the perimeter once he found a running lane. Denver’s pass-rushers had their way with the Redskins offensive line. Edge defender Von Miller’s patented spin move was on display throughout the first half. Broncos rookie Dymonte Thomas displayed a nose for the football when he was in the game. While it was not a perfect performance, Thomas made some pass breakups and recorded some key stops on third down. Quarterback Alex Smith was inconsistent, overthrowing some open receivers. Backup Kevin Hogan faced consistent pressure, but he was able to move the ball against the Broncos’ reserve defense. While Washington’s first-team offensive line was not perfect, having problems with communication, the reserve linemen struggled mightily with pass protection. The newly signed Adrian Peterson looked fantastic running the ball behind the Redskins first-team offensive line. He looked comfortable within the zone-blocking schemes and managed a couple of nice runs on outside zone plays. Linebacker Pernell McPhee demonstrated both speed and power as a pass-rusher, particularly when he dominated Denver’s left guard Max Garcia on back to back plays in the second quarter. On the first of those plays, he shed Garcia cleanly and quickly with a rip move. On the following play, he drove Garcia eight yards deep into the backfield onto the spot where Case Keenum should have been standing. It was something of a rough night for Washington’s rookie safety Troy Apke, who had three ugly missed tackles. However, Apke did make a nice play in coverage during the fourth quarter, as he made a tackle short of the marker that forced a Denver punt. 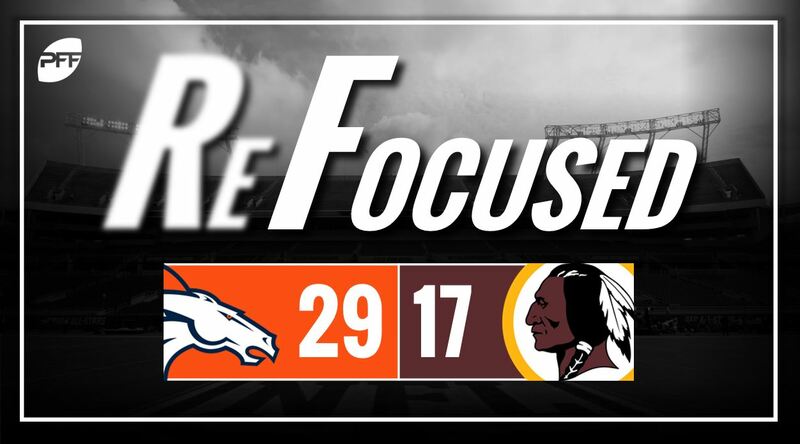 Denver: Denver finished with 29 points and managed to score in every quarter, but the performance of the offensive line is still a cause for concern going forward. There were simply too many plays where they allowed a defender to quickly penetrate into the backfield, both in the running and passing game. Should it become a pattern, that kind of weakness can truly be exploited in the AFC West, which features some of the best edge defenders in the NFL. Washington: Washington’s first-team offense was mostly ineffective, as Denver’s pass rush kept the Redskins passing game from finding a rhythm.